Every time an icon is clicked on or pressed, different and unpredictable aspects of the narrator's life appear on the screen. No reader will see the same patterns that other readers see. A map that gives an overview of how the icons are used in this work is available. 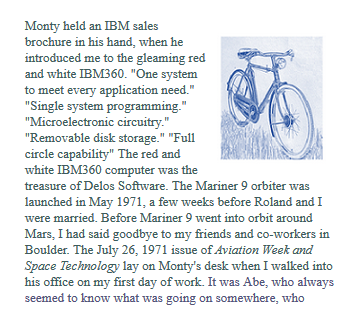 The gap between the acceptance of women programmers who worked during World War II and in the decades after World War II, and the much larger acceptance of men in the field in the 21st century is intrinsic to this narrative of one woman's journey from late 1960's information systems programmer in the aerospace industry in Colorado; to aerospace coder in Silicon Valley; to community network conferencing system programmer. In the process, the work explores hospitable environments for women in computing. 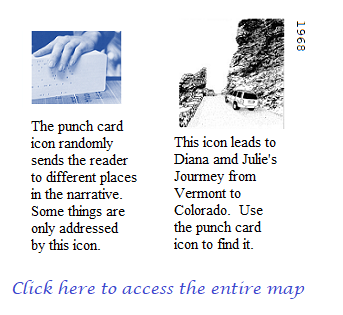 In When the Punch Cards Were Placed in the Punch Card Hopper, file one of Arriving Simultaneously, a seemingly fractured life -- of living in the mountains and at the same time working for an aerospace company -- is played and replayed with icons and generative arrays on one electronic manuscript page (and one accompanying "kaleidoscope" page). When Diana goes with Roland to Silicon Valley in "the surface of the system", generative arrays divulge a more complicated life in a radically different environment. And yet, Diana's life in Silicon Valley is also accessible by exploring only one active manuscript page. Fine-tune-mirroring the "clickbait" Internet environment in which it resides, a visual icon interface gives Arriving Simultaneously a playable virtual machine look and feel. The disordered, non-sequential way that we remember is expressed with fluctuating generative text; IBM punch card and floppy disk icons transport the reader in unpredictable ways. We don't remember sequentially. Writers of electronic literature use the affordances of electronic literature to tell stories differently. Furthermore, in my work, the goal of computer-mediated literature is not to eliminate all traces of the process. For instance, although, it can be programmed out, I retain repetition to emphasize the presence of aleatory composition. Although only three arrays appear at the onset, the surface of the system, the second file of Arriving Simultaneously on Multiple Far-Flung Systems, is composed of 14 different arrays. Each array contains words that provide a different view into the life of a woman programmer in Silicon Valley, beginning in 1971. 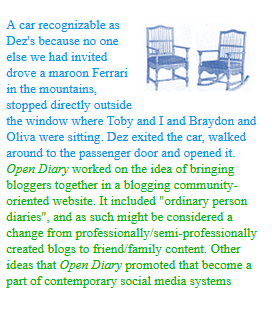 By clicking on the icons in the interface, to a certain extent, the reader controls what part of the narrative s/he sees. But, since the code generates every array differently, each time it is called, precisely what the reader sees is unpredictable. Additionally, which arrays the punch cards and the unlabeled floppy disk icons produce is also controlled by the computer in a random fashion. As a writer of experimental narrative, I write to an interface where the reader will absorb details, and gradually a picture of the life of Diana will emerge. I also know that if the reader only elects to spend a short of time with the work, a very different picture might emerge for each reader. Diana's life is complex, sometimes magical, sometimes challenging -- whether it is experienced in five minutes or in several hours. The Long and Short of it Lodge, file three of Arriving Simultaneously begins with a central image of the outside of the lodge in the California foothills, where a party for Diana's birthday takes place. Clicking on the central image allows movement between the outside of the lodge and the hall of the lodge where guests are arriving. In reading the histories of woman programmers in the days before University computer science departments were prevalent, I have been deeply impressed by their dedication, by their immersion in their work, and by their role in the development of the field. Arriving Simultaneously is fiction, but the details are informed by my own experience as an early information programmer for Ball Aerospace in the late 1960's; core community networking staff for Arts Wire, a program of the New York Foundation for the Arts, and a consultant and artist-in-residence in the legendary Computer Science Lab at Xerox PARC, as well as by my experiences living at various times in Silicon Valley. Within Arriving Simultaneously on Multiple Far-Flung Systems, the icons do not always produce text in a consistent way, but, in the same way that a reader discovers the underlying world model by exploring paths in a work of interactive fiction, with the continual traversal of this work, a portrait of a woman programmer emerges. The work is most effective on a tablet screen, but it also works on most laptop screens and has been tested with Firefox, Explorer, Chrome, and Safari. It can also be displayed on some mobile devices, but this will require vertical scrolling and a changed output pattern. My work began in 1976 with the desire to create works where neither were the images illustrations of the text nor was the text a description of the images. You can see this in the documentation of the card catalogs. 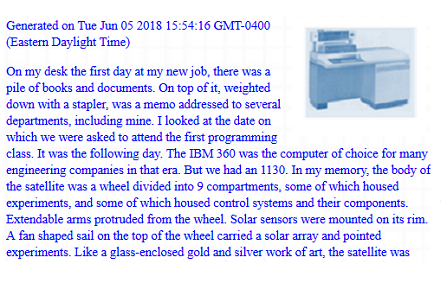 The relationship between the surface and the system is not workable in print, yet, when I used icons in the dividers in the card catalogs, that was what I was trying to do. However, the artists books were not as responsive or playable as are the files of Arriving simultaneously, when the punch cards were placed in the punch card reader and the surface of the system. Perhaps it will not immerse the viewer in who Diana is and how the changes in tech environments impacted her life. Nevertheless, I can also envision a print scroll or accordion-folded artist book of generated pages from Arriving simultaneously -- hung on a gallery wall from ceiling to floor or unfolded on a table. I would like to do this. One art form does not supersede or negate another. P.M. Newbold, and R.L. Hotz, HAL/S Programmers Guide. NASA-CR-134371, IR-63-3. Cambridge, MA, Intermetrics, July, 1974. "HAL/S is a programming language developed by Intermetrics, Inc. for the flight software of the NASA Space Shuttle program. HAL/S is intended to satisfy virtually all of the flight software requirements of the Space Shuttle. To achieve this, HAL/S incorporates a wide range of features, including applications-oriented data types and organizations, real time control mechanisms, and constructs for systems programming tasks." Dorothy Richardson, Interim, in Dorothy Richardson, Pilgrimage v.2, London: Virago Modern Classics, 1979 (Interim was first published by Duckworth in 1919). José Antonio Villarreal, The Fifth Horseman. NY: Doubleday, 1974. The image of Diana in Arriving Simultaneously on Multiple Far-Flung Systems is taken from an early photograph of my Mother, Barbara Lillard Powers (1916-2001). Editor of the Somerville Journal, Managing Editor of the Somerville Journal; the Cambridge Chronicle; and the Watertown Press, and long ago chauffeur for the French composer Nadia Boulanger. In the search for an image for Diana, I found quite a few in the Library of Congress Prints & Photographs Online Catalog. But in this era of wider circulation of images, I worried that someone would identify the women in the photos I was considering. And so, I was happy to use my Mother, in memory of the example that she set for the role of women. The image of the California hills in The Surface of the System is a detail from a drawing (watercolor and pen and ink, Judy Malloy, circa 2008). The cello used to key Diana's meeting with Gina and the forming of the Camino Gida Quartet was extracted from a Poster for Federal Music Project presentation of American Concert Orchestra, Federal Art Project, . Available in the Library of Congress Prints & Photographs Online Catalog. The image of the Long and Short of it Lodge was inspired by a gold mine, found in an 1881 history of the California gold country. The mine no longer exists, so I changed the image, and in the process imagined its foremost building as a lodge that recreates the spirit of the original gold mine. The image of the inside entryway to the lodge is adapted from a 1918 issue of House and Garden. Much time was spent perusing old issues of Hotel Monthly, until finally I found the two chairs extracted to key the Diana and Toby 2006 arrays. The image originally used for the third part of The Long and Short of Lodge was taken from A History of Champagne: With Notes on the Other Sparkling Wines of France By Henry Vizetelly. London Sotheran, 1882. Because there is serious element to this concluding page, this rowdy image is no longer in The Long and Short of it Lodge. Instead, with some alteration I used [The wine-glass] an undated etching by James McNeill Whistler (1834-1903). (Library of Congress Prints & Photographs Online Catalog). Many other icons created for Arriving Simultaneously on Multiple Far-Flung Systems began with out-of-copyright sources but were so altered that I am not listing the source.